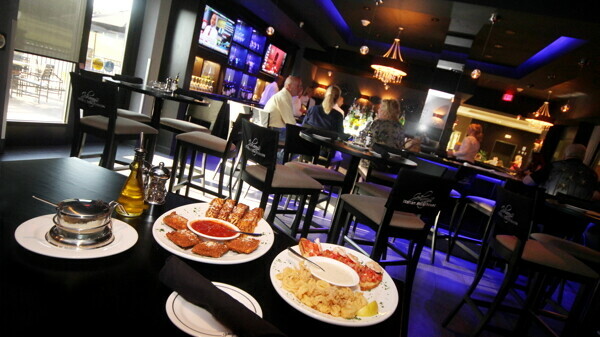 Johnny’s offers casual dining in an upscale steakhouse setting. Features Certified Angus Beef steaks with a robust array of Italian cuisine. The menu is a mix of traditional and modern dishes that are complemented with an award-winning, extensive wine list. The classic interior is an ode to the “Rat Pack” era and provides an intimate yet elegant supper club ambiance. Don't be intimidated by the word "steakhouse" – Johnny's offers lunch specials, a full gluten-free menu, and a breakfast buffet and omelette bar every day. Outdoor patio seats 35. You would be hard-pressed to find swankier digs in town to enjoy beverages than the blue-lit bar at this south-side steakhouse. The bar at Johnny’s serves up classic and signature martinis, wines, coffee drinks, and late-night desserts. If you’re a connoisseur, explore the award-winning selection of 125 varietals in the new wine room. Hosts a rotating tap list, wide variety of whiskeys, scotches, and liqueurs. Food served until 11pm on weekends.